Purple plants in the herb and vegie patch are eye-catching and provide a lovely contrast to the masses of green foliage. 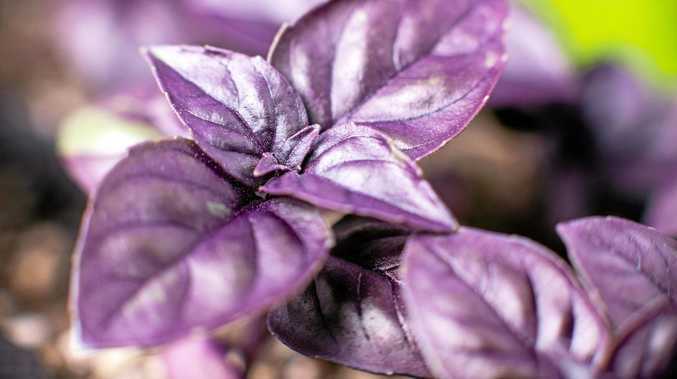 Purple basil grows abundant bunches of deep purple leaves with a rich fragrance and sweet spicy flavour. When left to flower, purple basil also has very pretty pink flowers that bees adore. Sweet basil is the more traditional bright green basil, with lots of lush and wonderfully scented leaves that are perfect for bruschetta and homemade pesto. Basil is a warm season herb and now is a great time to sow basil seeds. Choose a sunny or partly shaded spot in the garden or in a pot. It can even be grown on a very brightly lit windowsill inside. Sprinkle basil seeds directly where they are to grow and then cover with a 3mm layer of seed raising mix. Keep moist and basil seedlings will start emerging in 10-12 days. Feed your basil every week with a liquid fertiliser to promote lots of tasty and fragrant leaves. Leaves can be harvested from around six weeks after sowing.